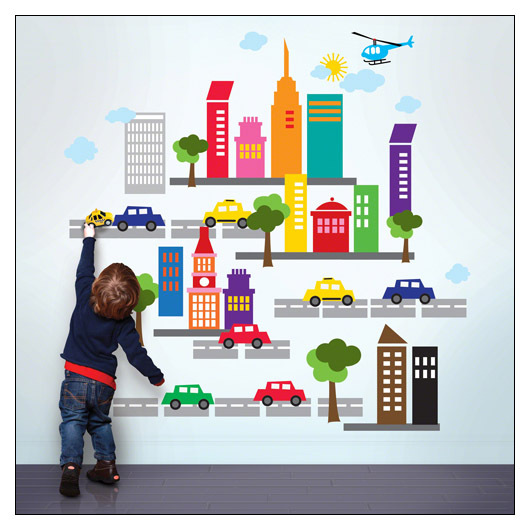 French Bull City Reusable Decals by Wallcandy (WCFBCITY) at Pure Design Kids / Toys / Wallcandy ::: Kids' Toys, Furniture and More at Pure Design Kids! Zoom past skyscrapers and trees with the French Bull City kit! Includes: 14 buildings ranging from 6" to 16" high, 7 clouds, 1 sun, 1 helicopter, 7 vehicles (approximately 6"W x 3" H), 5 trees (tallest is 10"), and 75" of road.